The Incredibly True Adventures of an EdTech Trailblazer: STOP Fighting the Change.... Be the Change! Have you ever had the same topic continue to pop up in your life over and over again until you just can't ignore that the universe is kicking you in the pants? This is what has been happening to me for the past few weeks. I have tried to ignore it to no avail. OK, Universe! I surrender! It started in my principal's office during my observation review. My principal, Dr. Freeman, mentioned reading Daniel Pink's newest book, To Sell is Human, and mentioned Daniel Pink's statements about teachers and the art of selling; that teachers are no longer the dispensers of information but need to be the motivators that can “sell” students on what they’re learning, A change in thinking about the way we educate needs to happen. Later that week I was on Twitter participating in the #teach2030 chat and mentioned Daniel Pink's philosophy on selling and education. One educator fundamentally disagreed with me basically stating that his students were to stupid to be trusted with ownership of their own learning. I stated that he underestimated his students. 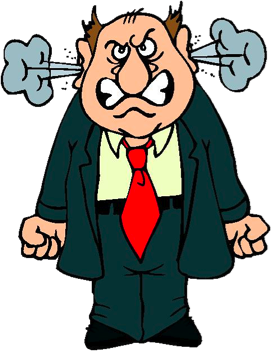 It burned me for the rest of the night that this educator has such a negative view of his students. This educator needs to change his attitude or get out of education. 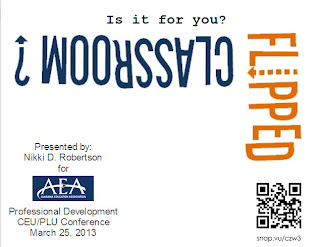 Next, I was contacted and asked if I would present a session on the Flipped Classroom for the Alabama Education Association CEU/PLU Conference. 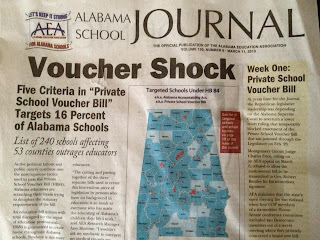 The hot topic of conversation at the conference was about House Bill 84 that would provide vouchers for private schools. I have been a member of AEA for 21 years. AEA has been a great advocate for educators in my state and have personally assisted me for which I am forever thankful. While preparing for my presentation at this conference about the Flipped Classroom it became more and more apparent the urgent need for change. At the last minute I added some changes to my presentation that I just felt couldn't be ignored, even if considered controversial or even traitorous in the union environment. First, I discussed how schools can begin embracing the change that community stakeholders are demanding, starting with individualized learning plans for every student; one of Daniel Pink's main statements about where education needs to go to remain relevant. Surprising to me, this topic came up in our new high school planning meetings. When I signed on to be a part of the new high school planning committee I thought we would discuss architectural aspects of the new school. What we really discussed was the future of education, individualized learning, space for differentiated classes, experiential learning environments, and other concepts not seen in a "typical" public school but more and more often found in private and charter schools. 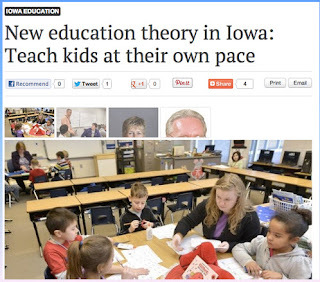 I added both this discussion and Iowa's plan to teach kids at their own pace to my AEA Presentation. Second, I broached the very touchy subject of charter schools, private schools and vouchers. 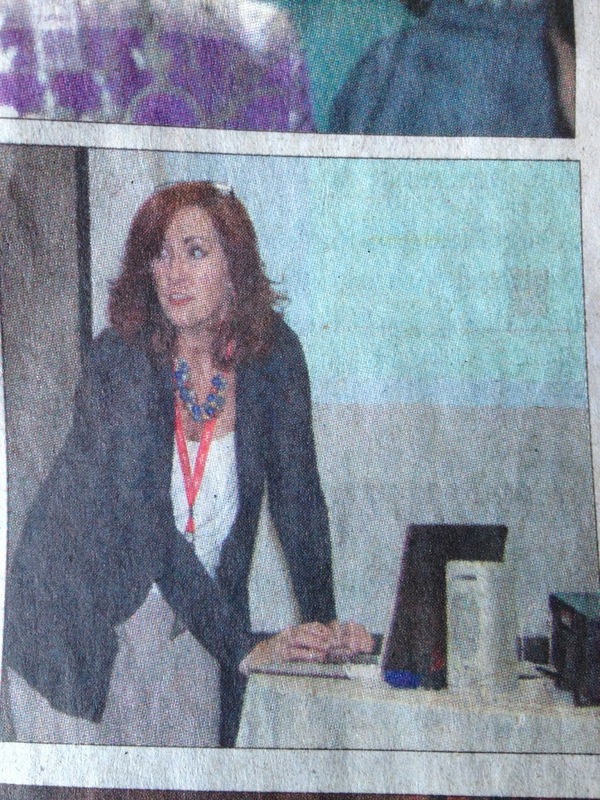 This subject was front and center during the AEA Conference with fiery speeches railing against the voucher system. While I support my union, I also know that vouchers, charter and private schools are not going away. Fighting against vouchers, charter and private schools may delay the change but will not stop the change. Community stakeholders are going to continue to demand a better education for their children and if that means moving out of the public school sphere, so be it. 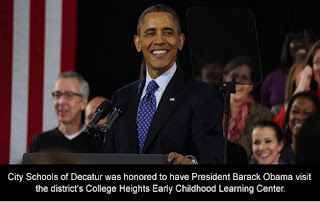 On February 14, 2013 President Obama visited Decatur Schools in Georgia. Decatur recently moved from a traditional public school system to a 100% Charter School System due to the demands of community stakeholders. A friend of mine sold her house and moved to Decatur just so her daughter can attend these charter schools. My suggestions to my fellow AEA members is to stop fighting against the changes. Rather, I propose they embrace change to create schools that meet the demands of their stakeholders thus rendering private or charter schools moot in their communities. It is my belief that the Flipped Classroom is one way teachers can begin to make the changes that our community stakeholders are demanding. The Flipped Classroom allows teachers to move outside of their comfort zones, work with students on a one to one basis, and provide opportunities to apply higher order thinking skills rather than rote memorization. 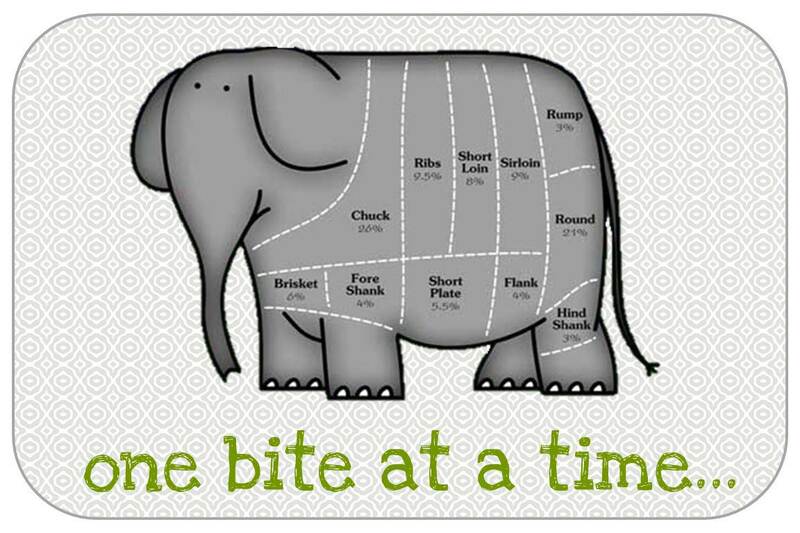 I like to use the "How Do You Eat An Elephant" analogy when introducing this concept to teachers. Teachers can start using the Flipped Classroom module or a modified version of the Flipped Classroom in small increments. 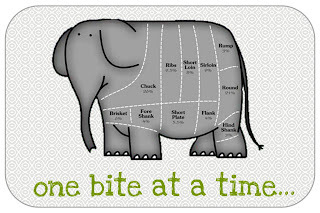 Try a lesson with one class with one lesson. See how it goes, make improvements, and try again with another class and another lesson. When I returned from the AEA CEU/PLE Conference I stumbled across a great online PD opportunity offered by the amazing Shannon Miller in partnership with the School Library Journal entitled, Be the Change. 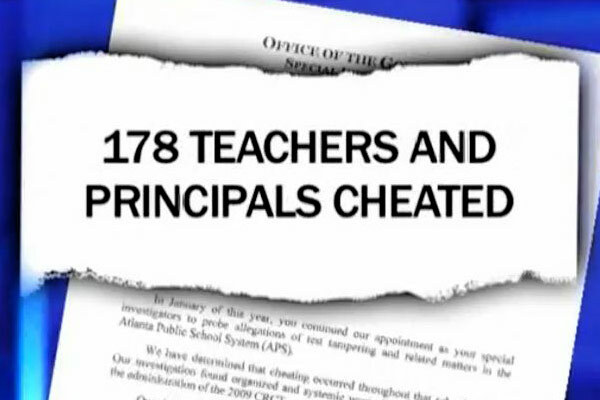 The final straw that broke the camels back and made me have to get serious and write about-Be the Change, was the Atlanta City School cheating scandal splashed across the headlines. Again, as Daniel Pink states, “Most of our education is heavily, heavily, heavily standardized. So, 11-year-olds are all together in one room. No 10-year-olds, and certainly no 13-year-olds. And [assuming that] all of those 11-year-olds are the same, we’re going to put them all together in a 35-kid classroom. Every educator knows that doesn't work well." What the teachers and administrators failed to realize when they got sucked into this awful cheating scandal brought on by a seriously flawed system of standardized testing was that when you embrace the changes that private and charter schools have embraced and that Daniel Pink addresses success on standardized testing takes care of itself even if you haven't spend one day "teaching the test". Early in my teaching career I actually had a superintendent who forbid any form of teaching that was not "teaching to the test". One poor teacher got yelled and cursed at by this superintendent the day before Christmas Break (he was known for walking into classrooms, railing on teachers and throwing dollar bills at the kids each time he said a curse word). She was doing an activity with her 5th grade students where they had to build their own gingerbread houses. This activity included measuring as well as reading and following directions, but because it was not in "test format" (aka: a bubble sheet) this activity was not allowed. So the looming question is, How Can YOU Be The Change? The Flipped Class is certainly one way to get started. Below I have listed some other suggestions for how you can Be The Change. Change your attitude. Embrace change. Think the best of your students. Believe in empowering yourself and your students to reach great heights. Look for professional growth opportunities. Stop waiting for your school district to bring professional learning to you, seek it out on your own. 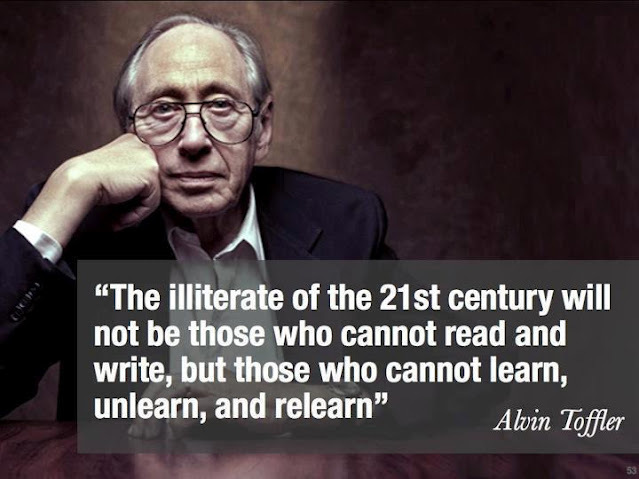 The best thing we can teach and model for our students is how to learn. Join Shelly Terrell's Teacher ReBoot Camp 30 Goals Challenge. 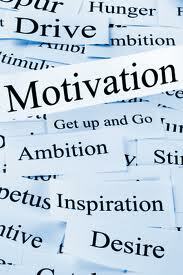 It was the motivating factor that changed my life! Find both free and paid webinar opportunities. As a school librarian, I love the TL Virtual Cafe's monthly webinar series and the monthly #TLChat Twitter sessions. The amazing Shannon Miller in conjunction with the School Library Journal is currently providing webinar opportunities in leadership. Simple K12 is a great paid for website for quality online professional development. They have free Days of Learning so that you can sample some of their great presentations. For a full listing of educational webinar sites available check out Cybraryman's Site! Write a blog. Take a look at student teacher interns. What is the one thing they have to do to Ad nauseam? REFLECTIONS! Student teachers must constantly reflect on every aspect of their teaching, their lessons, their interactions with students, their interactions with other teachers, their planning of lessons, their use of technology, etc, etc, etc. Why is it AFTER we start teaching we stop reflecting? A blog is the perfect way to reflect on your teaching as well as a way to learn and share with others in your field as you build your PLN. Click on image above to access my AEA presentation. Thank you, Sandy. I hope my membership to AEA & NEA doesn't get revoked! LOL!